The Ganley Foundation will be presenting. 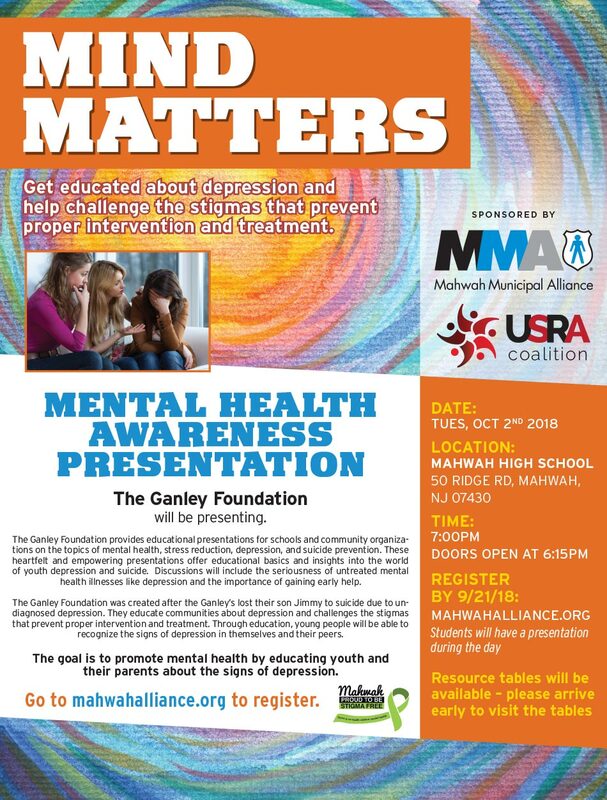 The Ganley Foundation provides educational presentations for schools and community organizations on the topics of mental health, stress reduction, depression, and suicide prevention. These heartfelt and empowering presentations offer educational basics and insights into the world of youth depression and suicide. Discussions will include the seriousness of untreated mental health illnesses like depression and the importance of gaining early help. The Ganley Foundation was created after the Ganley’s lost their son Jimmy to suicide due to undiagnosed depression. They educate communities about depression and challenges the stigmas that prevent proper intervention and treatment. Through education, young people will be able to recognize the signs of depression in themselves and their peers. The goal is to promote mental health by educating youth and their parents about the signs of depression.